My daughter loves animals and the outdoors, so a Safari Party was the perfect choice for her 7th party. It was also a great way to highlight my Dad's nature trail golf cart rides, which were incidentally the hit of the last party (ironically, a tea party). Our gift has always been the party, a time of memories with family and friends that will last a lifetime instead of toys eventually outgrown (though they always like the ones they get from party guests). However, our family is now a one-income family in the recession, so it saved our budget that we (or family members) already had the stuff we used for the party and the materials to make the rest. I only purchased the cake, ice cream, drinks, and paper goods. Grandmothers sweetly donated the party favors. I used a Stampin Up Stamp set In the Wild as the inspiration for the party. Included in this set is a giraffe, cheetah, elephant, zebra, and alligator stamp. I also used the stars and circles from my Wanted set, letters from my Headline Alphabet set (both Stampin Up), and an old office date stamp. This website was also a huge blessing because I found some great inexpensive and free ideas. INVITATION: I made a passport invitation, using dark blue cardstock for the front and light blue computer paper for the inside. I made a landscape computer template for the cover with a 2-row and 4-column grid. The rows in the 1st & 3rd columns were blank and the rows in the 2nd & 4th columns each had the Passport to Safari written in Africa Font. Each printed page made four passport covers when cut into half both vertically and horizontally, and folding those pieces into halves. I used a separate portrait file for the inside with a 4-row by 2-column grid for it. The top left rectangle had the invitation script (modified from idea 4636): This is your passport to a Birthday Safari filled with fun and excitement in honor of (child)'s 7th year. 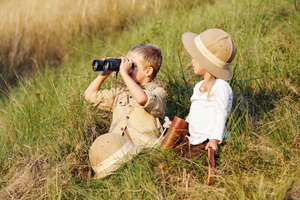 (Child) will be leading an expedition through jungle and Sahara plains on Saturday, (date). The adventure will last from 2-4 pm. All explorers will need to bring their completed passports to (address, city), Africa at the appointed time. Safari wear is optional, but adventurers may want to dress for the outdoors. Please call the customs office at (#) by (date to RSVP) to confirm your Safari reservation. I wanted it to resemble a real passport, so for the 2nd left rectangle, I used the draw menu to create a word art that said entry VISAS departure, created a vertical 2.75-inch line down the middle, then grouped the two, and rotated the group left. I copied this for the 3rd left rectangle. I used the bottom left rectangle for the requested passport information for guest to fill out. Across the top, I had Type: P and Passport number and numbered each. Next, I moved the margin cursor an inch to make room for a text box that said, Insert child's photo here. To the right of this box I had I listed the information requested with lines to write in their information. We requested the following information on each line: Surname: __, Given Name: __, Nationality: __, Date of Birth: __, Place of Birth: __, Date of Issue: __, and Date of Expiration: __. The top right rectangle was left blank, and I copied the entry VISAS departure and line group for the other 3 right rows, only I rotated those right not left. Then, when I printed out the invitations double sided (same page on both sides), each page made 2 invitations, when cut into fourths down the vertical and horizontal centers and then folding those into halves. The invitations were stapled into the passport covers so that the 1st inserted (right) page was blank, the 2nd (left) page was the invitation, the 3rd (right) page was the information sheet, and following five pages were for passport entries and departures (we had five activities, games, or stations). That way the passport opened as a portrait book, turned landscape for the two information pages (like a real passport), then turned back portrait style to stamp entries and departures. DECORATIONS: We held the party at my parents home. My talented Dad helped me make many of the decorations. He cut wooden arrow signs from old 2x4s and nailed the signs to stakes, after I used my alphabet stamps and the related jungle animal stamp along with black inkpad to create signs for each station. We placed the signs pointing into each station (Customs, Giraffe's Crafts, African Animal Expedition, Elephant Experience, and Zesty Zebra's Cake Canteen). Each station was set up with an animal stamp, a star or circle stamp and a stamp pad to stamp passports at the start and end of each station. Two African Safari signs directed guests to the party area. The 1st station guests came to was Customs at the side of the house, where I had a chair and small table my dad made from scrap wood and an old coffee table top. Here I used the large circle stamp from the Wanted set, an old date stamp, a red stamp pad and a can of child safe bug spray. The cake table had a black tablecloth, and we chose plain white plates, cups, forks and napkins, which still looked nice on one side of the black cloth with a zebra figurine acting as a centerpiece and the cake on the other side. The zebra stamp, a small circle stamp, and a black inkpad were in this station. I also set up our two small kid tables (each seats 6), which are (coincidently) camouflage green, so we skipped table clothes and just added a palm tree centerpiece to each. A back-porch fridge held punch and ice cream until cake time, and on top of the fridge, I placed an old blue cardboard box stamped in green with the alligator stamp, which held goody bags and the alligator stamp and green inkpad until the end of the party. My father has made an outdoor restroom (complete with running and flushing water) behind his house (converted from my old playhouse - he also built that himself with scrap wood, a window, door, and vinyl siding salvaged from other projects). For this, we also made a sign that said outhouse ahead, to mark the restroom. The sign for the Elephant Experience station was placed next to a mulch strip used for parking a bus my mom sometimes brings home from work (as Transportation Director for a school in town, she is also sub driver as needed). We placed an old red wood nightstand and yellow wood chair next to the sign. I decorated a box with elephant stickers to hold the elephant stamp, a small star stamp, a gray inkpad, and play coins (prizes for the game). The next station was definitely the hit of the party. My parents land is partly wooded. Since retiring my father has made a flowered trail that enters one side of wooded area, goes around, and exits on the other side of the woods. He's even built the grandkids a great tree house off the trail. At one entrance of the trail, my dad has made a fish cleaning station, which is a waist high stand of old timbers topped with the old sink and counter after he remodeled his kitchen (My dad's great at reduce, reuse, recycle). Next to the counter was the African Animal Expedition sign, and on it were a tiger figurine, the cheetah stamp, a small star stamp, and a brown stamp pad used for this game. My Dad did not need a chair for this station, since he was driving the Safari Jeep (golf cart) and just stood long enough to stamp passports upon entry and departure of the trail. In the open glove compartment like-space in front right of the cart, I placed the bottom of a Whitman chocolate sampler box, which I stamped in brown with the cheetah stamp. Inside was a jungle animal sticky pad and pencils for the guests to use on the ride. Along the trail, we hid over 35 jungle stuffed or plastic animals (tigers, lions, elephants, zebras, giraffes, monkeys, and snakes that my mom, sister and I already had). My mom and I enjoyed hanging the monkeys from trees, coiling plastic snakes around branches so that they hung out over onto the trail, sitting elephants among stumps, tigers in trees and bushes, and so on. The ages of the children at the party ranged from 1 to 8, so only a few were harder to see to distinguish a winner for the game (described later). ACTIVITIES: Guest entered the party through Customs. I used a large circle stamp from the Wanted set, the date stamp, and a red ink pad to stamp the entry side of the first page in the passport when the guest came to the party. Bug spray was optional. Next, I directed guests to the Giraffe's Crafts station, where they made binoculars. I found the craft online at the dltk site, but modified it slightly since we didn't use toilet paper rolls and I wanted to conserve card stock. Instead of printing it from online, I copied and pasted the large black and white camouflage template three times into a word document, adjusted margins to fit 3 templates onto 1 page (getting 3 sets of binoculars per 2 pages instead of 1 set per 2 pages). Then I printed the black and white template onto green colored card stock, cut out the templates ahead of time. Kids rolled these into cylinders and taped with clear tape, then continued with the directions. I printed the directions after copying them into a separate document, changing the directions to fit our craft, and placing at the bottom this craft was modified from the following original source with the website above. We cut black construction paper rectangles for the scopes and used electric tape for the trim. My girls and I each made a test pair a few days earlier. They used theirs at the party; I used mine for the model. GAMES: The African Animal Expedition ran throughout the party (guests could only tally animals during their first ride). It worked out nicely because as guests arrived at different times, they were able to make their craft and then go on the Animal Expedition. It staggered nicely so that those who arrived earlier could make their craft and then go on the ride/game. When each child arrived at the Expedition depot, they were given a jungle animal sticky note sheet and pencil to use during the ride, and they were told to make tally marks for each jungle animal they spotted on the trail. At the end of the party, we counted the tally marks and awarded the child who got the closest without going over a toy compass. Most of the children rode repeatedly, and then enjoyed playing in the tree house. My dad included many safety features, such as steps with rails, and a trap door that closes once you get into the house. He actually built his own home, so he is a capable carpenter, builder, plumber, etc. Because the kids had such fun on the expedition and in the tree house, we didn't actually get to the game we planned for the Elephant Experience. The idea for this game actually came from this site (idea 8613), and it was a relay race which separates kids into two teams, each with the children in a line. While lined up, each child bends down, sticks one hand between his/her legs and grabs the hand of the child behind them. With their other hand, they hold the hand of the child in front of them. It sounded like a riot, and we found some plastic coins in silver and gold for 20 cents for a 16 pack after Easter. We were going to give a gold coin to each child in the winning team, and a silver coin to each child in the runner up team (we like to avoid words like loosing team; we believe every child is a winner if he tries his best and has fun). Nevertheless, the kids had so much fun on the nature trail expedition rides that we just let them play. We finally got the kids together for cake, ice cream, and present opening at Zesty Zebra's Cake Canteen, after which we passed out goody bags, stamped the departure side of their Customs passport page with the alligator stamp, and said, See ya later, alligator. COSTUMES: The birthday girl had a costume of kaki shorts, white polo shirt, vest, boots, pith hat, and the binoculars she made. The prize compass for the expedition game came in a 4 pack at the Dollar Tree, and she used twine to make hers a necklace. Her sister wore an adorable giraffe costume inherited from a cousin until it got to hot (with kakis and a white shirt underneath). I wore kakis and a white shirt, and my dad dressed in his camouflage fatigues. PARTY SNACKS / CAKE: Due to our budget and the party time, the cake was the main party snack. We liked Wal-mart's specialty Diego cake backdrop, but my daughter didn't want a boy on her cake. Instead, a miniature Jungle play set of 20 or so animals, rocks, and trees (Wal-Mart $2.44) made a jungle wonderland similar to the Diego cake, with an antelope drinking from the stream, an alligator swimming in the stream, and the giraffe, zebra, monkeys, elephants, lions, tigers and birds on land. We also had vanilla cupcakes made with stripes of white and black icing (no chocolate) and vanilla and chocolate swirl ice cream to coordinate with the Zesty Zebra theme. We also served Tropical Fruit Punch. FAVORS: The favors bags were brown lunch sacks stamped with all of the jungle animal stamps. Each held a plastic tiger plate, toy snake, horn, jungle stickers, viewfinder, and snickers peanut candy bar.